Fluffy, soft and tender inside. Buttery and crisp on the outside. 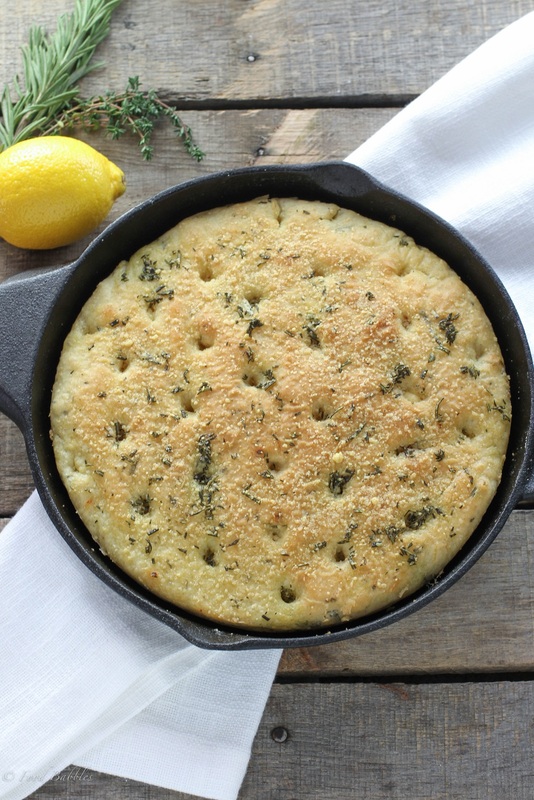 A summer salad or a vibrant pasta dish will go wonderfully with this quick, easy to make herbed skillet focaccia recipe. In the bowl of a stand mixer fitted with a dough hook, whisk together 1½ cups flour, yeast, sugar and salt until well combined. Add the water and 2 tablespoons olive oil, 2 teaspoons rosemary, 2 teaspoons thyme, lemon zest and crushed red pepper flakes. With mixer on medium speed, mix until well combined then slowly add ¼ cup flour and mix until dough begins to pull away from sides and begins to look smooth - but will still be sticky. Sprinkle surface with remaining ¼ cup flour and knead dough until smooth and no longer sticky. Shape dough into a ball and cover with a light kitchen towel. Preheat oven to 150°F then turn the oven off. Butter or grease a 10”-12” cast iron skillet. Roll dough to size of skillet and fit into skillet. Cover dough again with light kitchen towel and place inside warm oven for 20 minutes.